Water is a big part of a healthy lifestyle. It’s important to keep your body hydrated, it’s great for your skin and gives your metabolism a big boost. There seem to be little to no negatives to drinking more water. The problem is that I can never seem to get my daily 8 glasses. We are told to drink at least 8 glasses of water a day and for a lot of us that can seem like an insane amount of water! Who has the time to drink that many cups everyday? Thankfully, I have found a few ways to make that requirement easier to handle. Drinking a glass of water first thing in the morning. Before skincare and makeup, I run to my Soma and fill up a big glass. Drinking a glass of water first thing in the morning helps wake up my metabolism and it wakes me up too! It’s also a great jump start of getting in your 8 glasses daily. You haven’t even brushed your teeth and you already have one glass down, only 7 to go! Don’t like tap water, try a Bobble water bottle. I’m not a huge fan of tap water, but I also know how bad plastic water bottles are for the environment. I was at a loss for how to fix this dilemma when I discovered Bobble water bottles. Bobble water bottles are reusable bottles that actually filter the water as you drink it! Each filter equates to about 300 single use water bottles, crazy right? One of my favorite parts of the Bobble is how cute they are! They come in a ton of different colors so you can match your Bobble to your personal style. I opted for a Burgundy Bobble and it has helped me drink a ton more water while I am out and about. Checking off cups on a list. I love my to-do lists and crossing things off of it, so I started doing something similar for drinking water. Everytime I got up and out of my desk to go grab a glass of water, I’d make a little tally mark in my daily agenda book. It gives me a little sense of accomplishment to make a new mark each time. It also helps keep me on track about how many I’ve had so I know how many I have to go! Setting a daily alarm. There’s an app for everything nowadays, even apps remind you to drink water! Waterlogged is an iPhone app that helps remind you to keep on drinking! 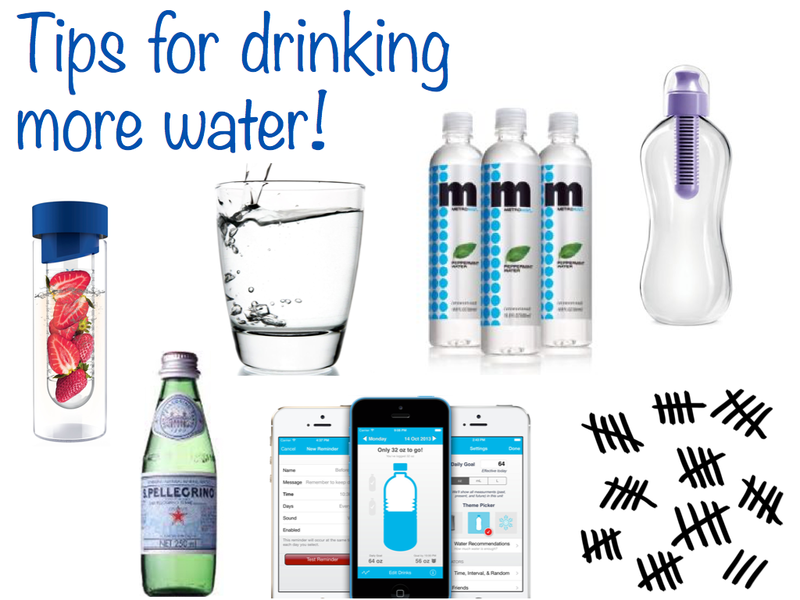 You can set up alarm reminders and chart how much water you’ve been drinking each day. It is a perfect app for all the tech savvy water drinkers out there! Drinking Flavored or Bubbly water. Personally, I can get kinda bored drinking water. It’s just never been terribly exciting for me so I tend to switch up the types of water I drink. I love sparkling, ‘bubbly’ water as I call it, and I always keep a bottle in the fridge. I also really like flavored waters, especially Metromint. Metromint is a mint infused water that comes in a variety of flavors like lemonmint and cherrymint. It’s the perfect thing for running around town or for in between meetings. It tastes great and gives your breath a minty fresh kick! Drinking Fruit Infused water. Fruit infused water has been my favorite go to drink this summer. Bottles like the Flavourit and the Citrus Zinger are perfect ways to get your daily intake of water in a fun new way! I love combining flavors like strawberry and basil or mint and pineapple. Fruity water is a great way to get your daily 8 glasses. Have any water-drinking tips of your own? Share them with me in the comments below!